On the auspicious occasion of 15mi raat of Shaban, Syedna Khuzaima Qutbuddin TUS led Maghrib Isha namaz, Washeq and prayed the Sajadawajhi Doa. 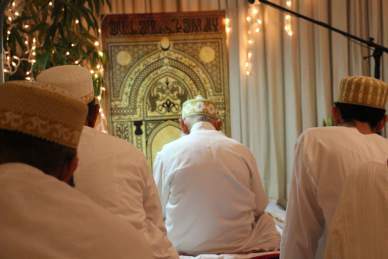 Syedna expounded on the significance surrounding this night and evoked strong conviction and emotion through his prayers. Syedna began by conveying that the month of Shabaan is the month of Rasulullah SA who is Sayyidul Mursaleen, the leader of all prophets, and this night that marks that middle of the month – the 15th night – signifies the importance of the rank of Rasullulah’s wasi, Amiral Mumineen. In this night, during namaz, Allah Ta’ala revealed to Rasullulah this ayat, “O Mohammed, now turn your face to Masjid-e-Haraam [from Masjid-e-Aqsa] (فَوَلِّ وَجهَكَ شَطرَ المَسجِدِ الحَرام).” Immediately during namaz, Rasullulah turned towards Baitullah. Syedna explained the meaning (taweel) of this ayat in great detail. The two parts of the month of Shaban that this night divides symbolize the two parts of religions, Tanzeel – the revelation of the Quran and Shar’iat and Ta’weel – is the meaning and significance of the Qur’an and Shari’at. Rasullulah is the saheb of Tanzeel – the first half of the month, and on this auspicious night he assigns the responsibility of Ta’weel to Maulana Ali, the saheb of Ta’weel. It is only with both of these Maulas that the Dawat can be sustained. Tanzeel is the miracle of Rasullulah and Ta’weel is the miracle of Maulana Ali and every Imam. Syedna Qutbuddin then explained the meaning of the amal performed this night and the meaning of praying the 14 rakats and the respective surats. Syedna explained that the 14 rakats we prayed signify the 12 hujjat-s of Imamuz Zaman, of whom the Baab is the first, and the Dai-l-Mutlaq (13th) and his Mazoon 14th). These hudood teach us how to do perform hamd (praise and thanks of Allah Ta’ala), they show us the meaning of tawhid (proclaiming the Oneness of Allah Ta’ala), they pray for Isti’aazat (mumineen’s safety from people of evil), and finally they show us how to do ma’arifat of Moulana Ali. Syedna emphasized that this night is one of the four most auspicious nights of the year – it is a night reserved for ibadat. 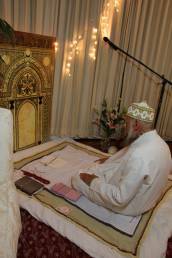 He beseeched God to accept our amal and prayers tonight and answer them multifold. Syedna reminded mumineen that Rajab – the month of Moulana Ali has passed, Shabaan – the month of Rasullullah is here, and soon before us will be the month of God – Sheruallah. Taking the wasila of Amiral Mumineen, especially since it was juma’a ni raat, the night which does dalaalat on Maulana Ali, Syedna Qutbuddin prayed that God may ease our difficulties and fulfill our desires. May he help us lead lives of good character and strong personality. May we have the opportunity for Hajj, umrah, and ziyarat of anbiya, aimaat and du’at especially the ziyarat of Syedna Taher Saifuddin and Syedna Mohammed Burhanuddin. May mumineen have the taufeeq, wisdom and courage to answer the call of the True Dai of the Imam -Syedna Khuzaima Qutbuddin. 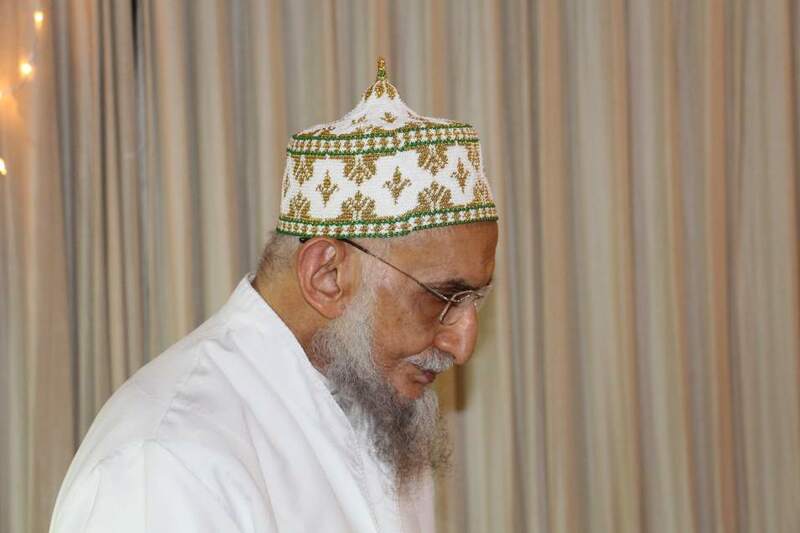 Syedna Qutbuddin took Misaaq of Mumineen who had gathered in Chicago on Friday afternoon after Jumoa Namaaz. Several Mumineen received the honour of Maulana Qutbuddin’s ziafat in Chicago, Detroit and California.